Spot the difference - on the left you have Statler and Waldorf from the Muppet Show. On the right you have Voronin and Turcan from the Moldovan Communist Party (photo: Stirea Zilei). Statler and Waldorf were two grumpy old men who would sit up in the balcony week after week heckling everybody that came on stage and criticising everything that went on in the theatre. Fozzie bear in particular came in for harsh treatment. Interestingly however, despite ostensibly loathing the performances, they kept on coming back for the next week's show and buying the best seats in the house. 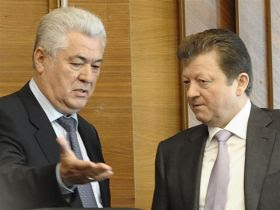 Voronin and Turcan are two grumpy old men who sit in parliament every week heckling every AIE deputy who tries to contribute to the debate. Liberalo-fascisto-romano-unionisto-extremisto Mihai Ghimpu in particular comes in for harsh treatment. V & T have the best seats in the house and, unfortunately keep on coming back for next week's show. Today, however, V & T decided that it would be more fun to stay at home and kick up a stink about how the AIE are supposedly breaking the rules about participation. They sent PCRM whiner-in-chief Grigore Petrenco instead (which is clearly breaking the rules given that he wasn't appointed by parliament...). 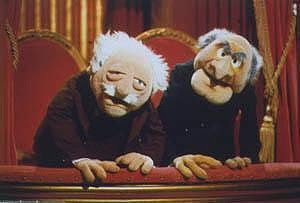 I think I've finally spotted the difference between the two photos above - Statler and Waldorf were funny.